IMAGE - An artist's impression of the XMM Satellite in orbit. At ten meters high and weighing four tonnes, XMM is the largest scientific satellite ever built in Europe. 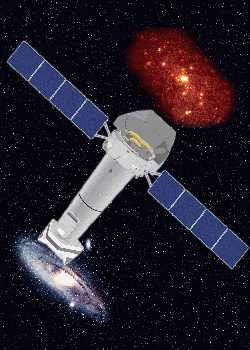 Its main payload consists of the largest X-ray telescope so far put in orbit. More info on the spacecraft can be found here and details about the spacecraft can be found here. 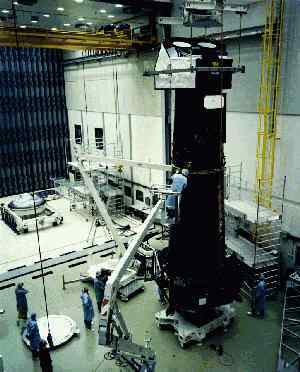 IMAGE - The large size of XMM is indicated by this photograph of technicians assembling the completed spacecraft.